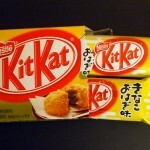 Review: Kit Kat Kinako Ohagi | Oyatsu Break! 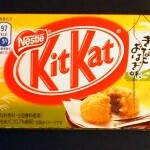 Another Kit Kat from the recesses of my fridge, Kit Kat Kinako Ohagi is a bit of a strange one. Based on an autumn Japanese snack, Kinako Ohagi are basically mochi–rice balls–covered in toasted soy flour–kinako–and filled with sweet red bean paste. It’s basically a whole range of flavours that we don’t have in North America, so I don’t think I’ll be able to talk about how well it captures the ‘taste’ of the original snack, but I will quite happily give you my impressions of it. 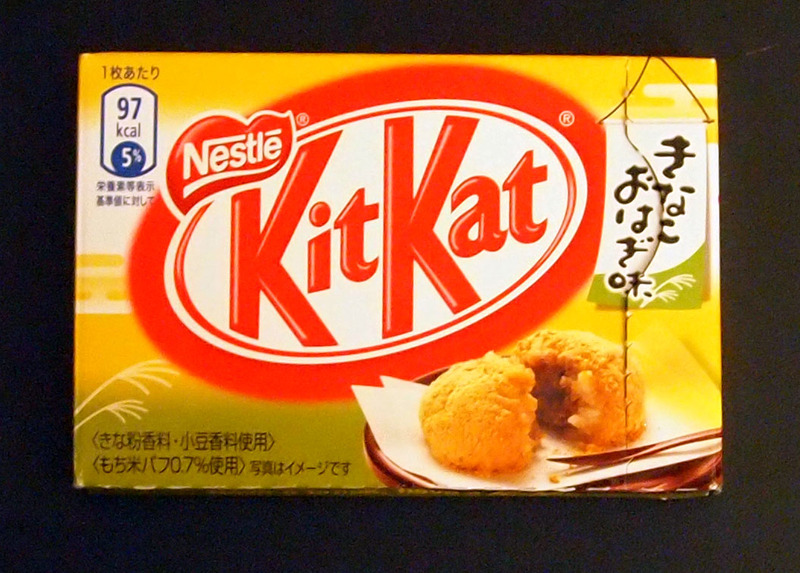 Oh, and a quick shout out to Japanese Snack Review and Jen’s Kit Kat Blog for providing the background info on Kinako Ohagi. 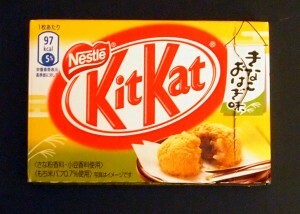 Packaging: Written entirely in Japanese, the lettering again denotes a Japanese domestic market product. While anything with even a whiff of the international about it will get English (or French) language descriptions, it seems that flavours coming from traditional flavours or seasons won’t have any more romanji on them than is absolutely necessary. It’s an interesting distinction. The packaging itself is very autumnal, fading greens turning to brown, orange-yellow sunsets, and a lovely shot of the snack we’re supposed to be ingesting a version of. 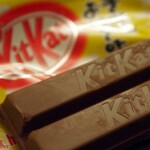 The yellow/green background really sets off the bright red Kit Kat logo. 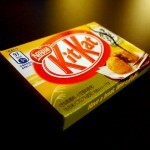 Scent: A very strong, earthy scent fills the air when you open the package containing the Kit Kats. Right away there’s a scent of the kinako, or toasted soy flour, and it’s quiet pleasant. It’s a sort of earthy, nutty scent, similiar to a light peanut butter or sesame, and it’s pleasant. It also smells strongly of chocolate. Taste and Texture: Sampling just the chocolate, it seems that the flavour of the kinako has been infused there as well as between the wafers. 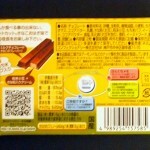 The taste of the kinako is lovely… it’s not quite smokey, but it is airy, if that makes any sense. There’s also a flavour of toasted rice, to mirror the rice in the Kinako Ohagi, and it compliments the chocolate and kinako well. While it is a sweet chocolate bar, it’s considerably less sweet than a standard-issue Kit Kat, and has a much deeper range of flavour to it. Having consumed most of it, I have to be honest and say I didn’t taste much of anything that tasted like red-bean or sweet-bean filling. The aftertaste has a bit of sweetness that I associate with asian, red-bean filled desserts (mostly Korean walnut cakes), but I can’t tell if that’s intentional or not. I feel like that’s something of a failing, to have what must be a very prominent flavour in the original treat almost entirely absent in the Kit Kat version… but then the original isn’t covered in chocolate either, so I suppose sacrifices have to be made. Finally, I should point out that the chocolate coating is filled with tiny bits of puffed rice, “mochi puffs” according to the package, that account for some of the extra crunch and probably a bunch of the rice favour of this candy bar. They don’t seem to be any different in texture than the wafers so I’m not entirely sure why they were necessary, but ‘necessary’ is sort of a dirty word when it comes to candy innovation anyway. Verdict: Well, I really can’t say how well it delivered based on what was on the box, but it is an unique flavour. The toasted soy flour, the rice, the chocolate and wafers, it all adds up to something special. 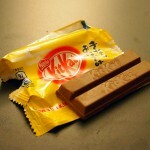 While I have no particular affection for kinako, I can see the appeal and perhaps as I experience more non-Kit Kat treats in Japan I’ll begin to develop an appreciation. And Since Kinako Ohagi seems to be an autumnal, seasonal flavour, it won’t be too long until it’s reintroduced again at some point in the future.